Johnny Depp stars as 'Charlie Mortdecai' in MORTDECAI. Mortdecai grumbled like a child, made business deals like a child, and threw hissy fits like a child, but this is not a children's movie. 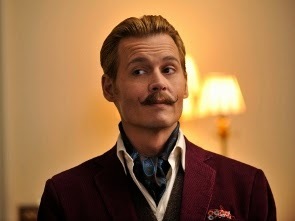 Johnny Depp's Mortdecai who is supposed to come off as endlessy zany is really just ridiculously immature. And that doesn't make the many attempts at comedy any more endearing. The plot involves a famous painting that was stolen underneath the nose of a murdered artist. The painting is more valuable than the murderer, and when MI5 is called in, Agent Alistair Martland (Ewan McGregor) turns to Mortdecai for help. While that move is questionable, Mortdecai is apparently very knowledgeable in the inner workings of art dealing, but more importantly, Martland has a thing for Mortdecai's wife Joanna (Gwyneth Paltrow). Johanna (Gwyneth Paltrow) and Martland (Ewan McGregor) in MORTDECAI. McGregor's significantly-more-suave Martland is particularly good here because his character isn't nearly as cartoonish as the rest of them. The movie takes a turn for the better when Martland gets the upper-hand on Mortdecai as he's a much more interesting character to follow. There is a lot of city-hopping, for the better as it does move quicker, and gives us even more beautiful production design. We move from London, through Oxford, a quick stop in Moscow (as Mortdecai almost gets electrocuted by Russian thugs), a long flight to Los Angeles which gives the film some of the best jokes, and then back to England when Mortdecai unfortunately gets the upper-hand on Martland again. The production design of all the locations was spectacular and the 60s design gave the film a flavour that the jokes were desperately lacking. There is an Austin Powers flair to the whole thing. Not quite as crass, but just as stupid and silly. It works to the film's disadvantage though since you feel like you've seen the whole thing before. Take any action-comedy spoof, mix it with Austin Powers, add a lot of moustache jokes and you've got Mortdecai. Not nearly as funny as it needs to be.